Radiant heat is used in much of the world today and relies almost entirely on the combustion of fossil fuels. As a result of requiring the use of depleting natural or manmade resources, efficiency is often taken for granted and costs tend to be high. Solar heat is a cost-effective and economical way that works for a small portion of the population. Unfortunately, solar radiation entails both good and bad forms of radiation. While the radiated heat from the sun certainly warms your skin, it can also burn or damage your skin if not filtered or protected against. Infrared heat utilizes the safest form of radiation without any of the risks or high costs listed above. 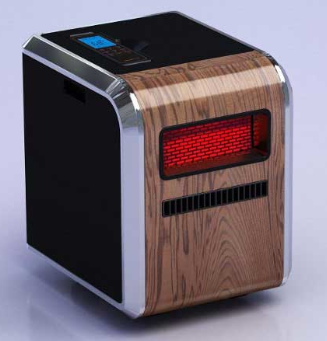 Safe, cost-effective and efficient portable infrared heaters push a natural heat into the room that is absorbed by furniture, flooring and the human body. This therapeutic heat has been proven not just to warm rooms but also to ease muscle and joint pain, increase blood flow and improve flexibility. In fact, infrared heat is so effective that millions of Americans have made small investments into infrared saunas to compliment their healthy lifestyles. Infrared heaters are safe and do not use a flame or emit harmful fumes. The heat stays where the owner wants it and the unit is simple to set up and operate. Most users report that their reduced heating bills paid for their unit within the first few months. Why wait? We can't control the weather, but we can manage the cost it imposes on our budget.